I am so excited to be here today as the Guest Designer for the wonderful monthly mixed media challenge blog COUNTRY VIEW CHALLENGES! I was just thrilled when I received an email from Chris asking me if I would do a guest spot. When she told me the theme was ANYTHING GOES, I stumbled a little bit. I sometimes find it hard to get inspiration for anything goes, but then Chris told me that Country View is celebrating their 2nd blogiversary, I instantly found my inspiration and decided to help them celebrate. So in honour of Country View's Birthday, here is my very first ever steampunk project, a birthday card for my dear ole Dad! The image is from a Tim Holtz stamp set which I borrowed from my good friend Cec of CW Card Creations. Thanks Cec!! I stamped it with Ranger Sepia Archival ink and then used the crackle texture stamp to give it an antique look. I'm still keeping up with my New Years resolution folks! This time I pulled out my Spellbinders Labels 21 and cut out four frames. I uses some DecoArt paints and Tim Holtz inks to create a wonderful crackled 3d frame. This frame was inspired by Tracy Evans and her wonderful 3d frame. The little arrow points to the hidden tag tucked in on the side. I used Tim Holtz's Arrow stencil and spritzed Walnut Stain spray through the stencil then fussy cut it out and popped it up on foam. 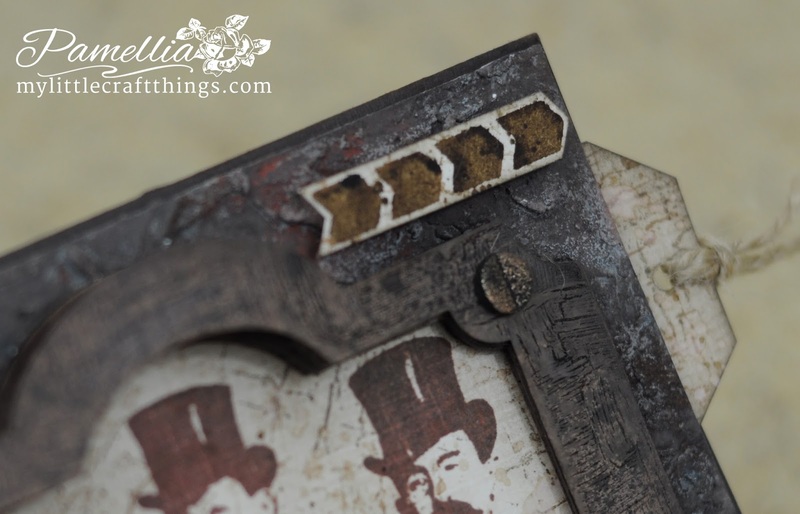 The tag was cut from Tim Holtz Tiny Tabs and Tag die. I used Wendy Vecchi's Potting Soil ink to stamp the sentiment and the crackle texture stamp to give it a nice antique pattern. I splashed it with some Gathered Twigs stain and some water. 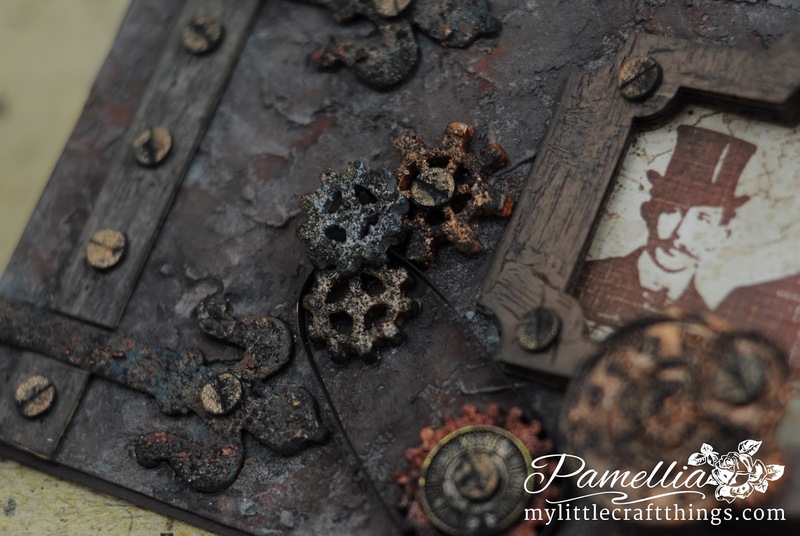 All of the gears were molded using crafter's clay and a Mod Podge mold. I used some DecoArt paints and some Ranger and Wendy Vecchi embossing powders and Tim Holtz Black Soot to make them look all old and greasy! Cool right! The background was also made from scratch using home made texture paste, various DecoArt paints, Tim Holtz paints, stains and sprays. 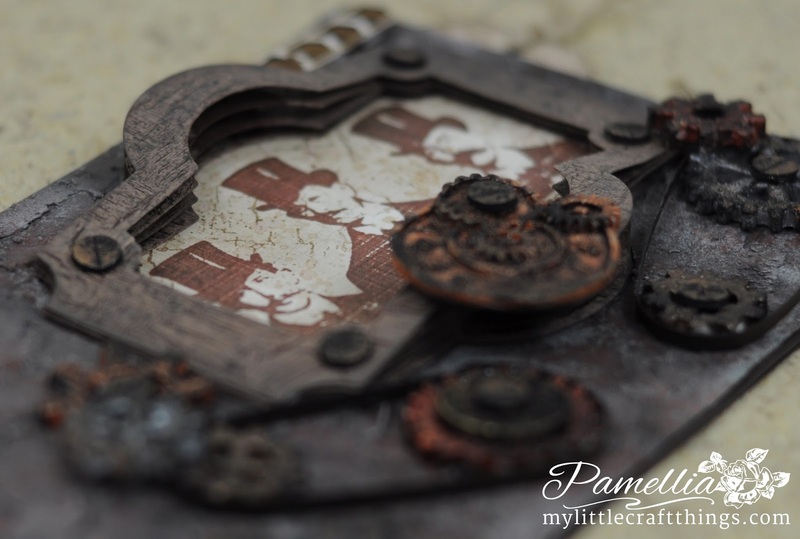 The hinges were cut using the Tim Holtz Hardware die and antiqued with paints and embossing powders. The screws are just cut from cardboard using a hole punch and I dented them with a credit card. 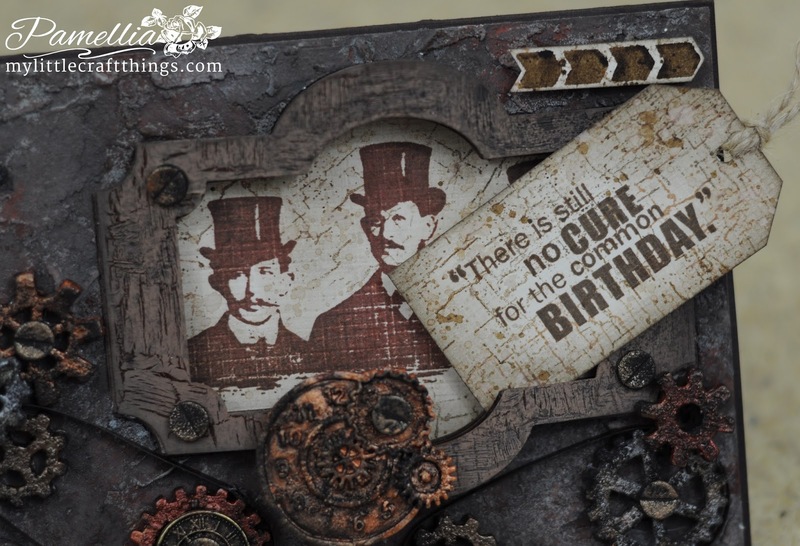 Never saw such an amazing grungy old steampunky look on a card! You have to definitely do more steampunky projects like this! they would be happy if you link I guess ..
Oh wow Pamellia, brilliant!! I think I have said this before, but you can truly master any style!! This is steam punk at its best!! Love the rusty aged look, the "hardware" looks fantastic, the screws and gears look so real, Love this whole project!! Your dad is going to love it!! Wooow, wooow, wooow, Pamellia! This card is absolutely the master piece of steampunk style! I love this rusty grunge style! This is really breathtaking! Bravo my friend!!! SUNNING OR WHAT! Pamellia you never cease to amaze me, every little detail is WOW! Right down to the screws, I would never have thought about just using a circle punch and denting them to look like screws, what a fabulous idea! The whole card really looks like old rusty metal, what more can I say I am in awe of your work, absolutely brilliant! WOW! WOW! WOW! Just brilliant. Thought I'd come to the wrong place when I saw all that rust and grunge. Pamellia you have really rocked this style Let's see more. Congrats on your Guest Designer spot Pamellia. This is stunning. I love the image with that amazing frame and all your detailing is just fantastic. 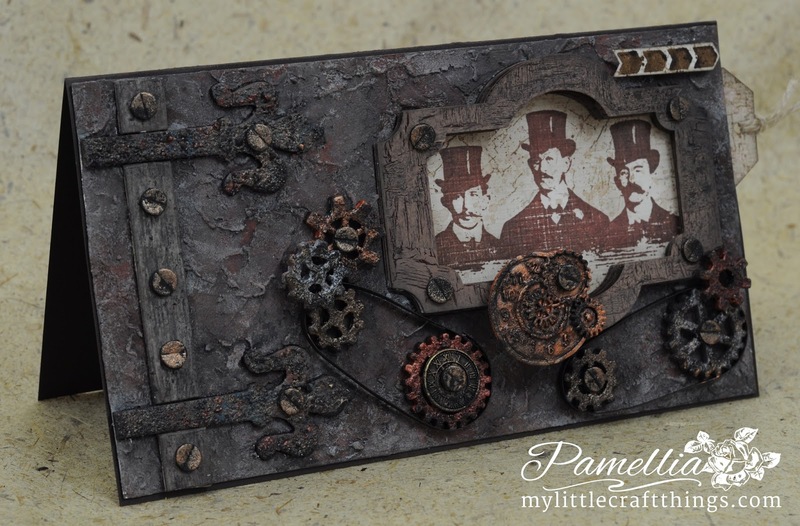 WOW Pamellia this is awesome, WOW, it looks like something that you would only find in an antique shop a very expensive one at that, the ageing effect is awesome, the image and the cogs look fantastic, this is one amazing creation, I love it. Well a complete contrast to your previous card! The way you have managed to make this look like a vintage object rather than card is totally amazing!! You are a wonderful artist! This is just fab, Pamellia. What else to say? You just rock any style. Loved the grungy textures and the rusty hardware. I am assuming you would have had problems with no flowers in this one, lol! Big hugs. Oh, Pamellia! Absolutely fantastic vintage & steampunk work! 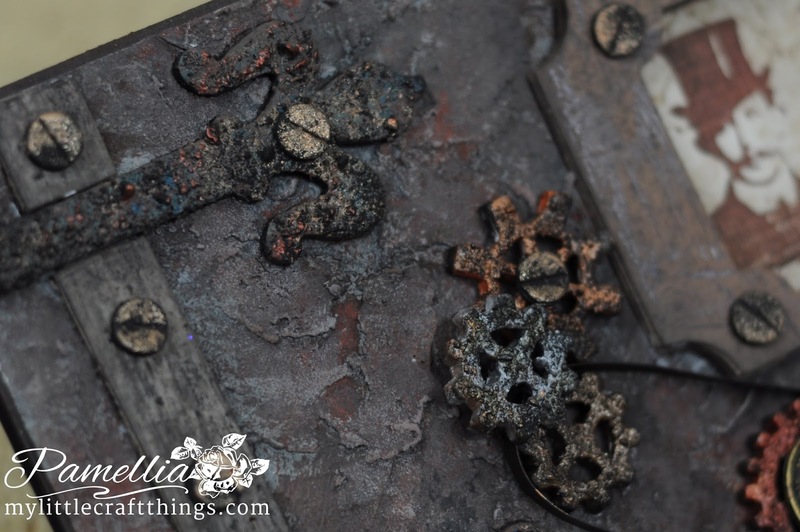 Great altered items and wonderful rust effect! Finally unveiled. 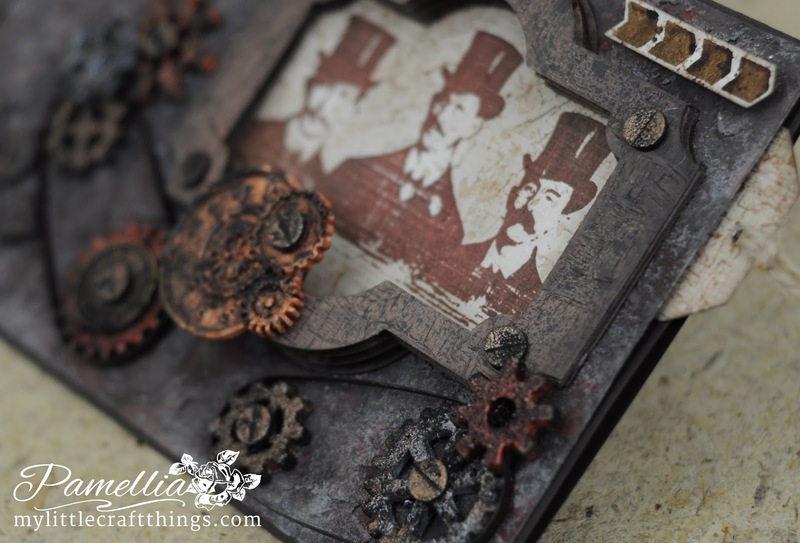 Love your steampunk card with all that great texture and cool handmade elements. I have to remember that I own pop dots because you use them so effectively to make wonderful layers. This is another winner and your Dad will be thrilled to receive it. Love, love, love this wonderful Birthday card for your Dad! It has such a great vintage and steampunk look to it! Loving all the gears! I bet your Dad leaves this card on his desk all year it is so nice! Thanks for playing along with us at Scrapy Land Challenge #13! Wonderful !!! looks so out of an old rusted warehouse, especially loved the screws !! Another masterpiece! The rust effect is wonderful! With simple materials you are able to create wonderful things! Wow this is stunning your Dad will cherish this piece of Art. Love reading all the tips you give on making the embellishments . Those gears look real ! Oh I am so proud of you Bubbles! What a fabulous Steampunk card. You are a genius to make the screws out of cardboard and just sent a slit it the middle, just genius! I love everything about this card and really want to see it IRL! You are brilliant and so versatile as an artist. Big hugzzzz muffin! Switching to DT mode-Thank you for joining us at SanDee&Amelie's Steampunk Challenge!! Carpe Diem! Wow! Is there nothing that you can't do Pamellia, this couldn't be more different from your previous creation. I love it and I'm sure your Dad will as well - absolutely brilliant. Stunning Steampunkery! I know for a fact that this look is not an easy one and it's very time consuming too but you have done a wonderful job Pamellia! Outrageous textures....you really are one special crafter! A fab, fab Steampunk creation! Love your grungy, rusty goodness! 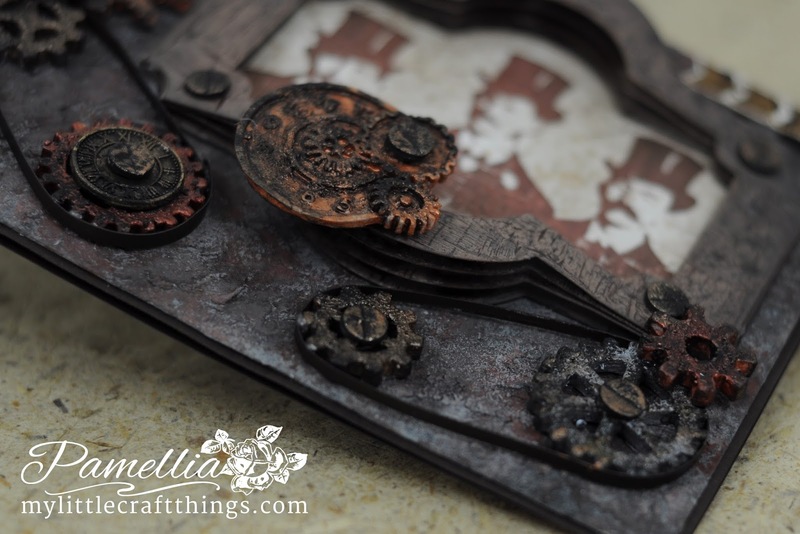 Thank you so much for sharing this awesome project with us at SanDee&amelie's Steampunk Challenges! Looooove this Pamellia, the queen of grunge has arrived. You have made a spectacular card for your Dad so full of wonderful texture and techniques and I'm so pleased to see it as guest piece for Country View Crafts and thanks for hopping aboard A Vintage Journey with it too. Wow! WOW! W O W !!!!! You have officially knocked my socks off! Whoda thunk you'de be doing this? I can almost smell the old oil and mechanical grease (which by the way, I find oddly comforting)! There's just way too much to comment on so I'll pick a few of my favorites...well it's all my favorite...The frame is just over the edge in coolness and I'm so stealing that! Every last screw, gear and cog looks like it's been grinding away for 100 years, that GREASE!!! that rust!!! OH MY GOSH are those screws just really hole punches???? You've got to be kidding!!! And those 3 gents have never looked more dapper! If your Dad is not just absolutely thrilled with this we are going to have Samra perform some brain surgery! Pamellia, this is right up there with that Haunted House, by the way where is that Haunted House? I have room for it on my dining room table as a centerpiece:):)!! I'm SO jealous that Cec gets to craft with you and you with her! I think I'm going to see if I can use this as my screen saver. But definitely pinning! Huge hugs! OMGosh this is so amazing Pamellia! 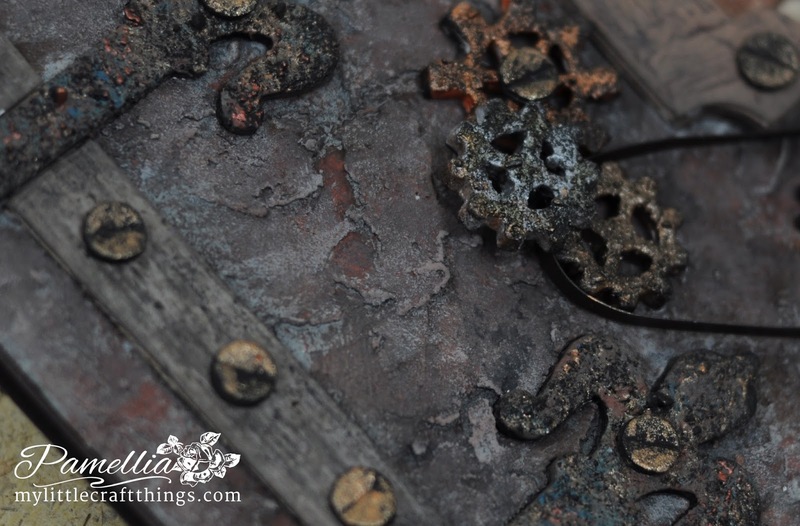 I love the fab Steampunk design and your gears are stunning- the rust effects look awesome! Stunning, an absolute master piece! Fantastic done! Thank so much for joining us at Though the Craft room Door challenge. Awesome card, love the details and the darker grungy colours. Your Dad will treasure this. I am not a fan of steampunk but what you have done here is truly AMAZING. So many elements to look at so much detail so much to take in. WOW you really have made a fantastic piece of art here. Love the Tim Holtz stamp and especially love the depth of your frame. There is just everything here to love looking at...just can't stop looking. 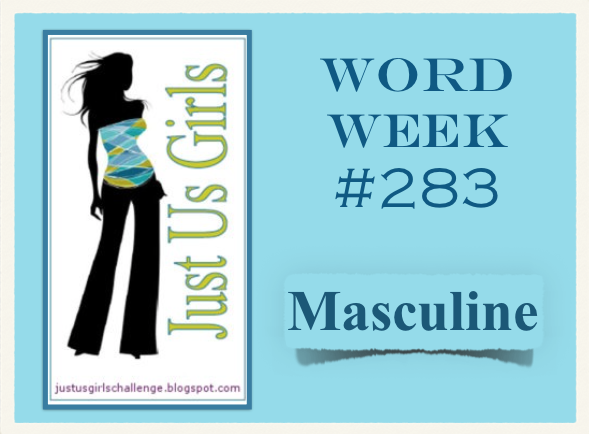 So pleased and happy you shared it with us at Just us Girls this week. I must have logged onto your blog at least 7 or 8 times today and left without leaving a comment because I just cannot think of the words to express how awesome this is. Overall it is brilliant but the detail is stunning, Your cogs look real, I am blown away at your rust effect and as for the filthy grim, amazing! I love steampunk and you nailed the look! Hope you do more. This card made me take a serious look at DecoArt products. Oh, Pamellia! The steampunk vibe on this incredible card just knocks my socks off! It looks for all the world like a vintage steamer trunk...and it most decidedly does NOT look like paper! I am just so impressed that you made all the gears, the screws, the frame....wow, wow, wow! The colors and textures are amazing, and you even (be still my heart) threw in a hidden tag pocket! You are a wonderful, inspirational, incredible artist and I am in awe of your amazing talent. wow WOW WOW! Pamellia - how do you DO it? Each creation is so fantastic, and I NEVER cease to be amazed at your spirit being revealed in each piece of art, so lovingly created - I can feel your caring nature and deep love in each one. This is nothing less of incredible, of course - all those layers, and such a way with shading, texture and color. Thanks for another morning of Beauty. Well, I'm not a steampunky kinda gal but this is beautifully designed and your usual attention to the tiniest detail is spot on. Poppa Pamellia will adore this. This has got to be the most outstanding steampunk card I've ever seen, hands down. I'm completely blown away by this card. I can't even begin to imagine the work that went into this card. Thank you for sharing it with us all! Well you certainly ROCKED steampunk for your first attempt!!! WOW!!!! Stunning card Pamellia!! Thanks for playing along with the Shopping Our Stash crew for our "Not So Heavy Metal" challenge this week!! WOW! I love this rusty grunge style! This is really amazing! Thanks for sharing your talents with us at Just Us Girls!! WOW!! That is really an outstanding card, and beautiful too. So much great detail with the cogs! So glad you joined us at Red Rubber Designs!!! Amazing textures and details Pamellia, your Dad is going to love it! Happy birthday to him and congratulations to you on being chosen to be a guest designer at Country View. This is so incredible, you really master every style you turn your hand to! Such a wonderful design and brilliant detail, as always. What an awesome First steampunk project! You have the steam mojo! Wow! Looks like wood, metal, old, so very cool! Textures are fantastic! Can't wait to see more steampunk and hope you will keep coming back to join us at SASPC! Have a grand day! Beautiful masculine card! Great job! Oh, my goodness I love this card! Great work on the Steampunk! OMG, anyone would think you had found this in a rusty tea chest, long lost for a hundred years. This is amazing Pamellia, you astound me with your art. Absolutely beautiful! Great work on the Steampunk!Thanks for sharing your talent with us at Scrappind4Fun Challenges. Hope to see you again soon!! HUGS! How wonderful Pamellia! 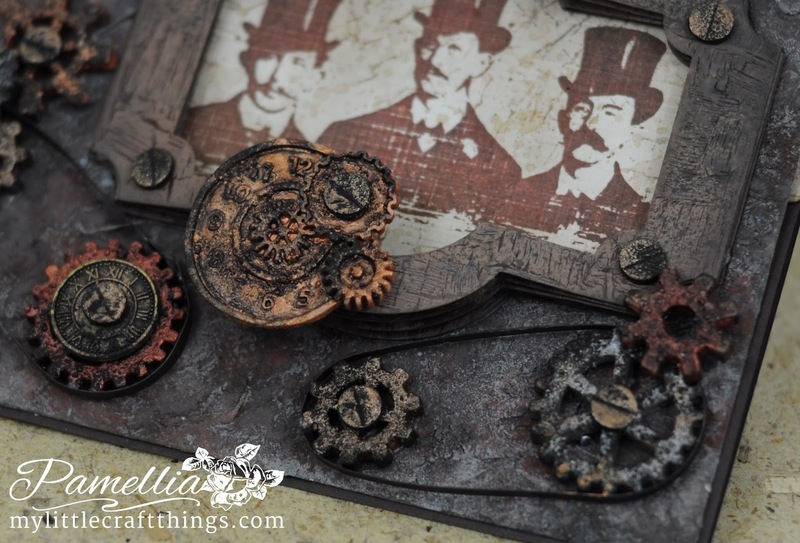 love all the rust and gears - great design with the hinges and framed steam punk men! Wow, I love this fabulous Steam Punk card. Even though I'm not really into steampunk style and that much prefer all the "oh so girly" things with tons of flowers and butterflies etc. I have to admit I really like this. I love how you made the gears look greasy. You just never run out of ideas, do you? Awesome work! LOVE your card. Fantastic detail and embellishments. Thank you for joining us at The Mod Squad Challenge. I am not much into Steampunk, but.....WOW I love all of the details and gears on this make- so much love and creativity on your makes! Thanks for joining int he not so heavy metal challenge at shopping our stash. Gorgeous project with so many details. Just fabulous. So fantastic to have you guesting with us this month, Pamellia - and what a grungily brilliant creation - a fabulous masculine make. Love all those cogs and gears and the rusty look throughout - what an amazing change of style for you!! SO awesome!!! Fabulous image and texture!! Thanks for joining us @ Red Rubber Inspirationals! Wow this card is really fantastic, I can just repeat what all the others been saying absolutely stunning and a great inspiration! Awesome .... 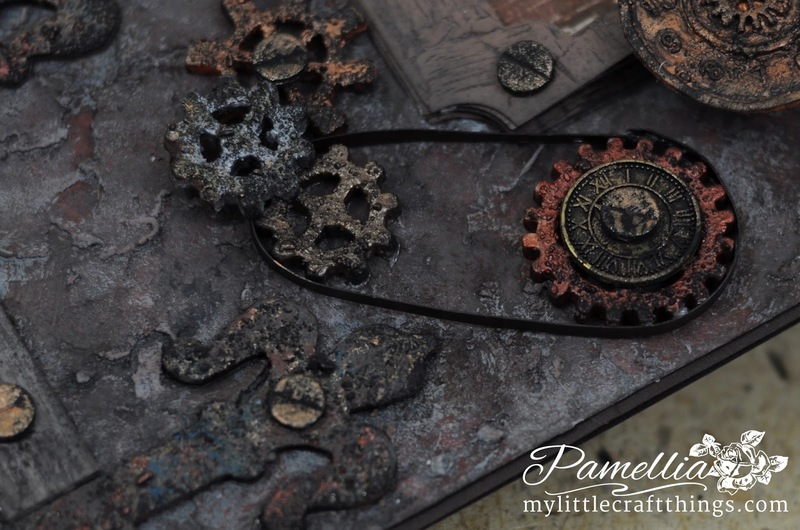 Thank you for sharing this on SanDee & amelie´s Steampunk Challenge! Awesome Steampunk piece! Thanks for joining us at the Take It Make It Challenge. Fabulous! Great textures, gorgeous layering, and eye-catching details. Thank you for playing with us at Take It Make It Challenge. Hoping to see you with us again in April! Wow, the texture here and the layers are simply breathtaking! LOVE it! Thanks for joining us this month at SASPC! BIG congratulations on Top3 at SanDee & amelie's Steampunk Challenges!!! This card is my favorite!!! Congratulations on making Top 3 at SASPC! These steampunk projects were very cool!